Once in Enhancement Tools you will have the ability to add MP4 video files. For more general information about the Enhancement Tools click HERE. Select ‘Video‘ on the right side of the edit area. – Navigate to the page to which you would like to add the video. – Zoom in on the area you would like to embed the video, if needed. 2. Create a Rectangle over the area that you want the play button to sit over. 3. Select the MP4 that you wish to embed from the drop down menu . 4. You can view the video in the edit area to confirm that it is correct. 5. The “Active” Checkbox will be selected by default. If you would like to embed a video but not make it active immediately, the ‘Active‘ checkbox should be deselected. 6. Click ‘Save‘ to complete the activity. This will reprocess the file to include all changes. 2. 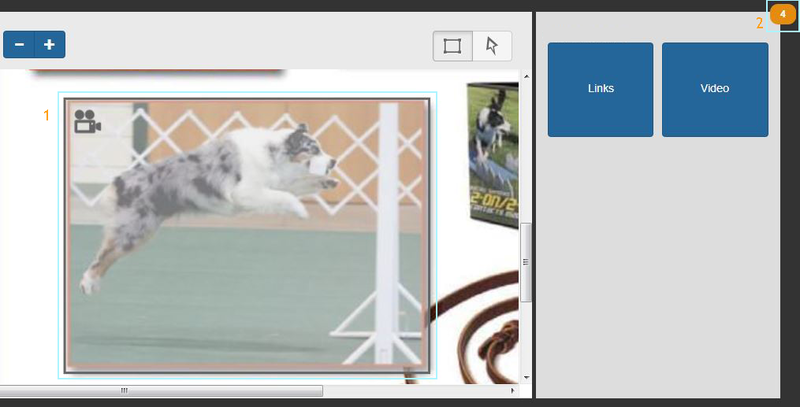 Use the pointer tool to select the video on the page you would like to edit. – Delete the video completely. 6. If you change your mind and no longer what to edit your video hit ‘ Cancel‘.